In the interest of transparency, I am a rather die-hard Acura fan. I like the tenacity of Honda’s premium division, and have long considered RDX to be one of, if not, my favorite personal driver 2-row SUV. For 2019 we discover not only a cutting edge body style but undoubtedly the most intuitive easy to navigate tap-and-play touch pad to monitor interface available to the automotive industry today. Once mastered, between the rather intuitive smart wheel controls, tap-and-play “true” touch pad, and exceptional voice recognition, the driver’s eyes remain on the road, as they should. 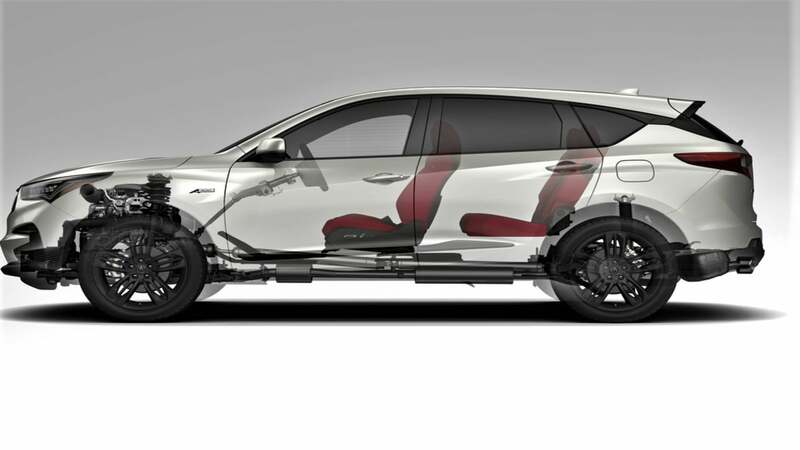 On the active safety side of the equation 2019 RDX now comes standard equipped with Acurawatch, a very comprehensive driver assist and accident avoidance electronic safety package. I first experienced driver assist technology in Acura TLX. Acura’s precision crafted cockpit puts the driver one with the car, while making infotainment, and hands-free personal electronic connectivity a snap. But how’s she drive? Does the NSX inspired styling and performance injection equate to a superior drive and ride experience? Looking to the reinvented RDX platform one doesn't necessarily thinking all-weather, much less all surface. Last week an auto enthusiast buddy of mine took a look inside the cabin of RDX A-Speck, and immediately assumed sports-car-fast, moderate comfort, and just ok road handling. Nothing could be further from the truth. While not as track happy as Acura TLX, or NSX, RDX A-Speck comes factory equipped with a very roadworthy fully active dampened independent tuned suspension, exceptional fade-free disk braking, minimal body roll, and no noticeable torque steer or nose diving through the 2-lane sweeps. When equipped with available 2nd generation SH-AWD, Acura RDX performs in wet weather as if riding on rails. The driver and occupant of the vehicle will not sense the transitional inner workings of Acura all-wheel-drive. It’s seamless, as it should be. I noted no loss of traction on our latest wet weather outing. And believe me, I pushed it! On that January day it rained well over 2 inches in Western Oregon. With the windshield defroster on, thanks to rather good variable speed wipers, visibility remained doable. On the power side of the equation we discover a rather seamless Type-R derived 2.0 Liter super low friction DOHC 16 valve VTEC 4 cylinder turbo charged engine, and 10 speed automatic transmission. This rather brilliant mill produces 272 peek horsepower at 6500 RPM, and class leading torque (280 ft-lb at 1600-4500 RPM) in the low to mid range, right where you need it the most. As to fuel economy, I experienced a real-world 23 MPG combined in foul weather driving. Acura engineering does a commendable job in pairing this race proven engine with a wonderfully seamless 10 speed automatic transmission. and IDS, (Integrated dynamic system) resulting in a plethora of drive dynamic and road surface traction options. Me, I like sport +. But be ready for a body and sensory workout. 2019 Acura RDX is quick and responsive, without question. Looking through the RDX cabin one finds a Lexus-like, Volvo style, minimalist plush. Acura refers to RDX as a luxury SUV, that it is. But it isn't overly fancy, ostentatious, or in your face blinged-out. The piped, leather and fabric surfaced seats are impressive as to overall comfort and ease of adjustment. And, when set in the optimal position for your body size and arm reach, driver to vehicle control interface becomes intuitive. And while a bit loose by track car standards, brake and steering feedback is better than good. The arm rests, door trim, and dash molding sweeps in harmony with burnished metals, hard and soft textured fabrics and plastics. Interior ambient lighting comes alive at night, as does the aircraft-like 2-dial dash, oversize programmable i-MID, and color top center dash mounted monitor. That too is split view capable, and acts much like a smart pad when controlled via the smart touch pad. For two row crossover and SUV lovers, when looking to the price point, 2019 Acura RDX A-Spec sits at the top of the segment with exceptional value and a bit of sport for your driving dollar. As with all Acura’s 2019 Acura RDX A-Spec will take on the personality of its owner. This Acura affords long stretch fatigue free highway journeys, sport driving on the back roads, and mild off road duty. With the second row folding in the down position, owners will discover a do-all, carry all workhorse, that’s as happy in the dirt and snow as it is in valet parking. What I’d change: I’d add an engine and transmission option, tighten up road to steering wheel feedback. * A bit loose. And, take another run at improving rear visibility.